The Milan motorbike show may be the largest in Europe, but this year, the star of the show may not be a motorbike. This new vehicle is a bit like a Smart Fortwo, but more utilitarian in its definition, and in its build quality too. It’s a Piaggio. You know Piaggo, a leading Italian company which invented the legendary Vespa more than 60 years ago. More than 10 millions have been built, and today Piaggio own several motorbike brands, selling more than half a million vehicles per year, scooters, motorbikes and small utility vehicles with 3 or 4 wheels. 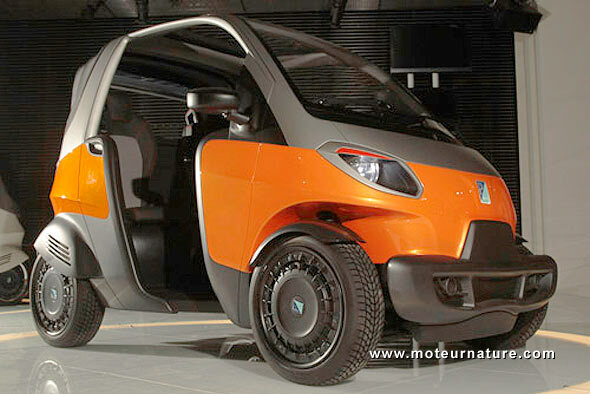 But today’s concept, code-named NT3 is hardly Italian, it’s an idea from Piaggio India. 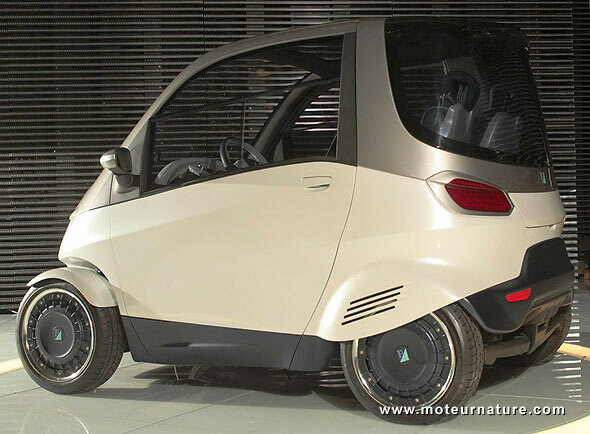 The idea behind this Piaggio NT3 is close to what Ratan Tata had in mind when he launched the development ot the Nano, the world’s cheapest car. The Piaggio NT3 doesn’t plan to compete against the Nano strictly on price, but I guess it could. It’s a very small vehicle, only 94-inch long! Width is accordingly ultra short 59-inch, but to make it usable by normal adults, height is a more impressive 63-inch to make a the NT3 a real 3-seater. The driver sits alone in front, with the passengers behind him, one on each side. Note that they have fantastic leg space. But you might wonder where the engine is, and it’s at the best possible location, under the back seats, nearly between the wheels. This engine is even smaller that the vehicle is. 3 engines are already planned, the smallest being an incredible .2-liter one cylinder. 200-cc. Many lawn movers have bigger engines! Top speed is a feeble 40-mph, but remember this is not a car planned for American highways. Its playground should be India’s congested big cities. Some good news might be that a bigger engine is available, it’s a .3-liter affair. Still smaller than a can of soda, but it raises top speed to an 50-mph (Gosh!). The best point is fuel economy since that with either engine, the Piaggio NT3 should get more than 67 mpg. And there’s more with an hybrid version. 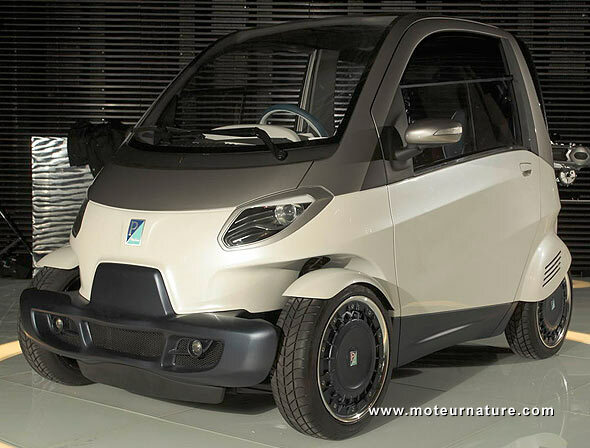 Like the other powertrains, it’s not a brand new engine, but a development of a scooter drivetrain: in this case, the 3-wheeler MP3 hybrid. Top speed is 50-mph with the gasoline engine, and 19-mph with the electric motor. The driver can block one or the other, he can also let an electronic brain decides what’s best. To sum it up, this Piaggio NT3 looks very promising but at this stage, it’s only a concept. Piaggio has shown 2 models, the white one which is the normal version, and the orange one which is a cheaper one, without doors, nor side-windows. 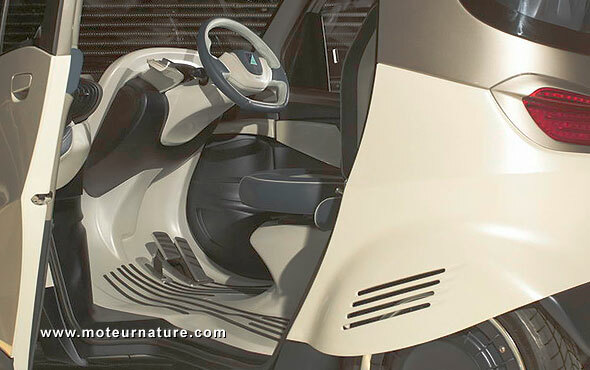 It could be in production in India in 2013, finding plenty of buyers there, as well as in Viet Nam and in all Asian countries where there is a strong demand for mobility without big money to satisfy it. There’s no plan to bring it in America, and I guess few people would miss it.